Please bear with me. This is not going to be easy. I just got back from Art Basel Miami Beach, which has become much, much more than a very large art fair. It is now a sort of a mega-convention in the classic, berserk, hog-wild, industry-wide sense. A convention, of course, is a place where people in the same line of work go ostensibly to do business, and then wind up doing everything else. But the art world consists of so many lines of work—imagine a convention that combines the qualities of the Raccoon Lodge, Trekkies, Tailhook, the Democrats, and the Republicans, and then embellish from there. In old Hollywood movies, conventions were where married businessmen went to go wild with booze and babes. And there is a lot of going wild in Miami. Sometimes you can't tell the art dealers from the hookers without a business card. But A.B.M.B. is even more than a convention because the general public has taken it up like a spectator sport or a festival. It even partakes of pilgrimage in a sort of anti-Burning Man way. The dealers come to enrich themselves and the bourgeois come to improve their status, while yet others come more or less to rub against one another and get sticky in a validated context. Me? I'm there to combine the opportunity to do a year's worth of gallery hopping in three days with the chance to get over the cough I've had for three weeks. 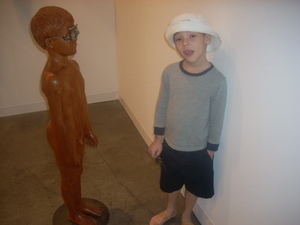 I was also delighted to take Oscar, my seven-year-old son, to look at art and see what struck his fancy. And to do some laps in the pool at The Raleigh. Here is a seven-year-old looking at art. Every year that I have attended Art Basel Miami Beach I have come to a new realization. The year before last, it was that the art world is the ultimate consumer of fashion. Last year it was the idea that the art fair had surpassed the biennials, Documenta, and all of the other highbrow institutional conclaves, becoming the organizing model of the art world. Art is no longer run by philosophy but money. This year I began to see the art world as something much bigger than I'd ever suspected. The art fairs are now various things to various people. They are, yes, the Big Convention. The big culture convention. And this year it seemed that the partying had reached a frenzied, non-stop, almost desperate level. But the art world has clearly moved into a larger place in our society. And it has to do with money. Which everyone was talking about. I was talking about it officially, having been recruited to moderate a panel discussion on "The Worth of Art," which, coincidentally, is the title of a book by Judith Benhamou-Huet published by Assouline. She possessed the prettiest face and best French accent of the group, which also included David Ross, former director of the Whitney Museum and now curator of the Artist Pension Trust; Jeffrey Deitch, the P.T. Barnum of art dealers; and auctioneer Simon de Pury of Phillips de Pury. Some have greeted the high prices with indignation or consternation. Jerry Saltz, the art critic of New York magazine, has argued that high prices become part of art's content, disrupting its meaning. Critic Dave Hickey, often a chiding voice of reason, claims that that the market has become a bubble, fed by "greedy artists and stupid collectors." And it is true that art buying has been so frenzied that people have compared the action to the Tulip Bubble of 1637. But while everyone on our panel agreed that prices are extraordinary, no one predicted that the bubble, if there is one, might burst. Jeffrey Deitch sees the tremendous growth of the market as a natural byproduct of the transition to an "information culture." Mr. de Pury pointed out that there is unprecedented liquidity in the market and that it may be that things are just getting warmed up, as more and more players enter the market. Mr. Ross and I pointed out that the art market enjoys many advantages over other financial markets in that is opaque and essentially beyond regulation. The art market cannot be regulated in the way that the SEC regulates the financial markets, I suggested, because the determinants of prices are inherently ephemeral, even inscrutable. You can't be accused of insider trading in the art market because the market is predicated on insiderism. Everyone feels like an insider, and the struggle is to see who emerges as one in dollars and cents. Sure, there might be a mortgage crisis, but there now seem to be markets that are relatively immune to the strife besetting the benighted middle classes. The luxury businesses are still hot. And what's more of a luxury business than art? There are almost five hundred billionaires in the U.S. alone, and almost nine million millionaires. That constitutes a pretty healthy collector class. As one waggish auctioneer has put it, after you've got your fourth home, a yacht, and a G5, what are you going to spend your money on? 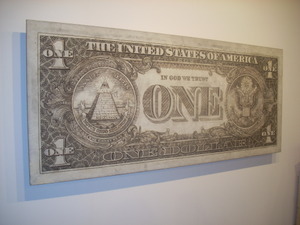 It would seem that as long as there is "hyperliquidity," there will be an art market. And so it grows. Today Art Basel Miami Beach is not just one art fair. There are now twenty different fairs taking place in Miami at the same time, selling art, photography, and design. It is now quite impossible to see everything, so aesthetic triage happens. I intended to do more, but after seeing everything at Art Basel Miami Beach in the main convention center, then visiting NADA (the New Art Dealers Alliance), and then SCOPE, I was exhausted. I guess I had visited about five hundred dealer's booths. Doing the fairs is interesting in terms of seeing what artists are doing. You really do spot trends. Last year there were many, many artists making very large, hyper-detailed color photographs of what might be considered tedious subject matter, in the manner of Andreas Gursky and Thomas Struth—I think Dave Hickey refers to these as "Large Cibachromes of three Germans standing around a mailbox." (They are still at it, but the subject matter seems more focused on strip mining and other industrial unpleasantness. I doubt those will go in the dining room.) Last year there were many small sculptures on the floors—I noticed because I was looking at the high heels of the female gallery directors and assistants. This year there was a lot of deliberately bad abstract painting in shades of mustard, ketchup, and relish. There was a lot of paint-can trompe l'oeuil where what appears to be liquid is actually solid. (Perhaps symbolic of the "hyperliquid" market.) Oscar was fascinated by these faux liquids, as he was with the profusion of large scary monsters at SCOPE, many made out of old tires, which may or may not have some allusive petrochemical significance. Absolutely peaking at the moment is Asian cuteness, mostly Japanese otaku, but the Chinese are getting in on the act, too, with Buddha- and Mao-related pop art and post-modern porcelains. What began with Hello Kitty has become a tidal wave of unbearable anime and manga. Eventually the cuteness began to aggravate me, to the point where I began to feel much the way Edmonton Oilers coach Harvey McTavish must have before pulling the tongue out of the mouth of Calgary Flames mascot Harvey the Hound. The hardest part of looking at the art at an art fair is the fact that it is surrounded by people who are often more bizarre, startling, intriguing, or complicated. The first day of Art Basel Miami Beach features a preview for the press and VIPs, and so generally you have to be an early bird to catch a glimpse of the high rollers who are making the pot bubble. After that the hordes descend, those who make any market interesting by trying to get in on it. I noticed many graying moneyed couples who strongly resembled Thurston and Eunice Howell of Gilligan's Island, closely inspecting the strange products on display at SCOPE and NADA. Perhaps this is the real story: the attempted apprehension of art by a new class of consumers. I couldn't help but wonder what revelations Art Basel Miami Beach might bring next year. Too bad I have to wait. But wait…that gave me an idea.